Its Raining giveaways this month. Since the festivities and holidays season is approaching , its time to reward the readers of my blog. 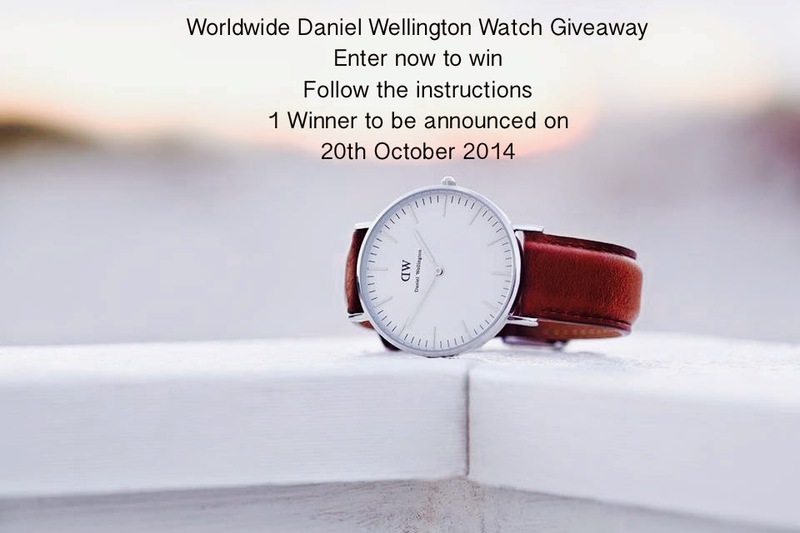 I am giving a chance for you'all to win a Daniel Wellington watch. The Steps are easy. P.S: I am holding the same giveaway on my Instagram profile too. You can choose to enter on any ONE platform as of now. mention which is your favorite Daniel Wellington watch from their Website and Why ? Done with all the steps. Hoping to win! i've just entered this giveaway! have followed all the steps ! Thank you for thus wonderful giveaway..
Their watches are perfection! Great giveaway! Already entered on instagram! Following you in GFC as well. Do I need to mention the watch link here as well? this is such a wonderful giveaway & I'm excited to be a part of it! The watch that I'd like to win is: "Classic Southampton Lady" in rose gold. My fav : Classic St Andrews Lady http://www.danielwellington.com/us/classic-st-andrews-212 because it looks simple but elegant. Hi Surbhi! and DW thank you for doing this giveaway! As a biker and proud owner of Royal Enfield Bike (Standard 500- Forest Green), My watch must match the same royalty while on the road. I like the color combination of band which perfectly goes with my color of motorbike and the utility is 6mm dial so that I can wear it under my riding gloves too. In short class and passion both stay intact all the time. First of I'd like to Thank You for giving this Incredible Opportunity to win a Daniel Wellington, which happens to be one of my favourite Time Piece maker in this amazing Giveaway. makes it Stand Out of the Clutter. The Combination is Simply Outstanding. The Watch is perfect for me because it goes real well with Every Outfit and Perfect for every Occassion. Be It Business Meetings with Affluent Clientele or a Post Lunch Golf Session with Your Boss or an Ethnic Evening with Family members. Its Sheer Brilliant Design makes it Cynosure on Every Occasion and people really have hard time to get their Eyeballs of It. The Main Reason behind my enormous Love for the brand is Filip Tysander, A Designer and Explorer now Entrepreneur who met an Englishman, None other than Daniel Wellington, who was donning a Customized Rolex witha NATO strap. This Swedish genius then Got the Idea of Incorporating this and Make this a Fashion Statement. He Very well Chased his Vision and Crafted the Time Piece with Absolute Passion, making it Uber Alles. But Would Like To Conclude My Comment Looking Forward to Your Fine Sense of Judgement. Lovely blog and gorgeous giveaway, thank you!!! I love its classic and classy crocodile bracelet, and its deep brown color, just gorgeous!!! Hi Surbhi.. (I am Surabhi too!). Thanks for the giveaway. I have been reading your blog for sometime now.. and really like it. I have completed all the mandatory steps and now I hope to win. :) I wish to win Classic Southampton Lady watch. My favorit watch is the Classic Bristol, because it is the most beautiful of all for me. b/c its such a minimal yet classic statement accessory that really fits my style. Really hope I can win so that I can add a classic timepiece to complete my wardrobe.